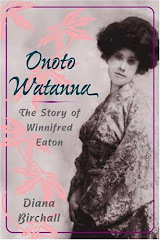 Fifty years ago - don't you love stories that start that way? The Mickey Mouse Club was the biggest children's TV show in the country, maybe the world. It was also one of the first, for in 1955 when it began (it ran for three years), most people were just starting to get black and white televisions for the first time. We got our first TV that year, and the Mickey Mouse Club was the first show I watched regularly. When something is new, and you are young, the impression can be indelible, and for me and my friends, the world stopped every afternoon for an hour as we ritualistically settled in front of the TV to see the Mouseketeers. The show featured cartoons and nature shows and serials, but it was the Mouseketeers, the troupe of talented dancing and singing children, who were the whole point. We admired them, picked out the ones we liked best, obsessed over them, and for three years of our lives we watched them grow up. They were like friends, but they belonged to the most enviable club in the world. Any child watching longed to be a Mouseketeer. To be picked out from all the children in the country for your talent, and go to work at the Disney Studios, and belong to a group like that - it seemed unimaginably wonderful. Annette Funicello quickly became the most popular and famous Mouseketeer. She stood out on black and white TV with her curly black hair, her sweet expression, and her undeniable ethnicity - there'd never been a child star before with a "foreign" name and look. Everyone loved Annette, but she wasn't the most talented: that was Darlene Gillespie. Darlene could sing like a bird, and was the star of many of the musical numbers. Then there was Doreen Tracey. She wasn't as exquisitely pretty as Annette, or as talented as Darlene, but she had a special sparkle, a joie de vivre, an enthusiasm and bounce that made her irresistable to watch. She was the personality kid who epitomized the whole group. 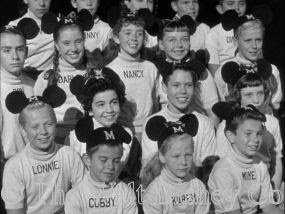 For years I dreamed of being a Mouseketeer, and dancing up there with Annette and Darlene and Doreen and the others. They appeared in serial stories too, "Spin and Marty" which took place on the Triple R Ranch, and "Annette," with Annette playing a country girl. It was all pure magic, one of the best (and only) sheerly uncomplicated pleasures of my childhood, and I never forgot one bit of it. Over the years, I'd tape the shows in reruns - I knew this was a strange eccentricity in a supposedly sane and sophisticated adult, but I never lost pleasure in watching an old Mickey Mouse Club tape. Reassuringly, the Mouseketeers were frozen in time; they never changed. There were no troubles in that world, and it was always amusing to watch the 1950s teenage life, with dance numbers taking place in soda shops. Last year, I was thrilled to get a writing assignment to watch filming of The Jane Austen Book Club, because it took place at the Disney Ranch where "Spin and Marty" was filmed. The ranch is otherwise off limits for visitors, and I loved seeing the rolling hills that hadn't changed a bit since Tim Considine and David Stollery rode over them on horseback. I ended up calling the story "A Golden Afternoon," referring back to the Disney song from Alice in Wonderland (which itself refers back to a phrase in the actual book.) 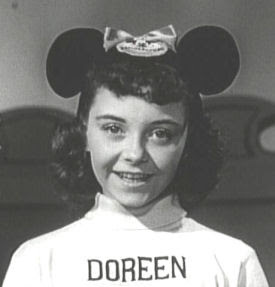 And then, even better, a few months ago, I finally met my first real life Mouseketeer: Doreen. It was while I was preparing for the Harry Potter Lexicon trial. I had just met with the nine foot tall lawyer in the pink suit at the Warner Bros legal office, and as I was leaving, I noticed a name plate - Doreen Tracey. Suddenly I remembered reading that Doreen worked at Warners. I'd never sought her out, because there must be 10,000 employees, I'm seldom on the lot, and besides, it would be admittedly a kind of wacko thing to do. But I looked over, and there, sure enough, sat Doreen. She works in Intellectual Property, and when I exclaimed at seeing her, she spoke to me very graciously, obviously used to this happening. When she heard how well I remembered her, and that I worked in the Story Department, she asked me to email her and we'd plan to have lunch. 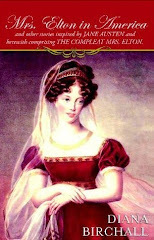 Doreen is now in her sixties, but still recognizably very much herself, perky, vivacious, warm and friendly. We exchanged a few emails, but when I wasn't used in the Harry Potter trial, our lunch got put off. 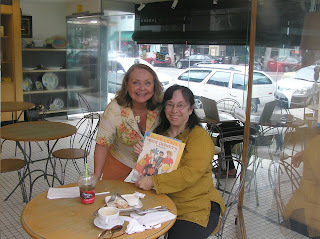 Until yesterday, when I spent another Golden Afternoon, having lunch with Mousketeer Doreen! And she's wonderful: warm and down to earth and smart and still very recognizable as herself - a gregarious, outgoing, energetic, bright, creative, savvy lady. She drove out from the Valley to come see me, and ran up against the summertime Santa Monica parking snarl, but I rescued her at a gas station and took her to Amelia's, the little Italian family-owned sandwich shop where I have lunch every day. We had cannelloni bean and ham soup, and shared a meatball sandwich and almond torte, with cappuccino. And we talked a blue streak for nearly three hours, just like any two lunching ladies of a certain age with a lot of history and interests in common! 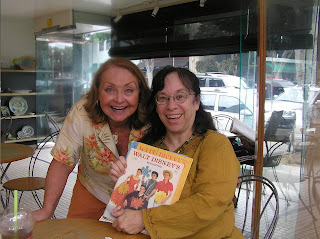 She told me some inside stories about the Mouseketeers (wild horses would not persuade me to reveal them publicly, except to say that the Mice are all really good friends to this very day), she signed all my memorabilia, and we talked about our lives, and how she plans to write a book called Confessions of a Mouseketeer. 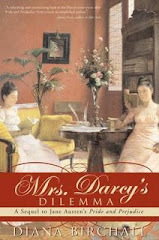 I invited her back to my house to see our books and she was kind enough to buy Peter's new poetry book. I was left with a wonderful feeling of connection with the dreams of my childhood, and that I really do have a friend at last who's a Mouseketeer. You lucky, lucky, lucky lady. Doreen was always my favorite! She seemed so, well, normal. Still has the same wonderful smile. I feel so excited to think you met my favorite mouse! I somehow related to her more than any of the others. My first movie seen at a theater was Westward Ho The Wagons. I wanted to see it because she was in it. I wish she was more visible today . Thanks so much for letting us know more of her. I think as much it is uncommonly important and instructed. I should need to thank you for the exercises. 'Fricases and quelquechoses' - or, a little bit of what you fancy!